After the Chernobyl incident in 1986, I became interested in monitoring background radiation on a long term basis. With the proper analysis such monitoring could have detected the fallout from Chernobyl here, in California and it could also detect more common sources of radiation, such as radon gas accumulation. To accumulate long term statistics like these an ionizing radiation detector coupled to a microprocessor controlled data logger was required. The detector is the classic Geiger Mueller tube, which are still manufactured in a variety of types for just this very purpose. The drawback is that GM tubes require a high voltage supply, approximately 900V in the case of the one I used, with fairly good regulation. In my unit a DC-DC inverter consisting of a 555 oscillator driving a power MOSFET and a small step up transformer supplies the 900V and a string of miniature neon bulbs serve as the voltage regulator. 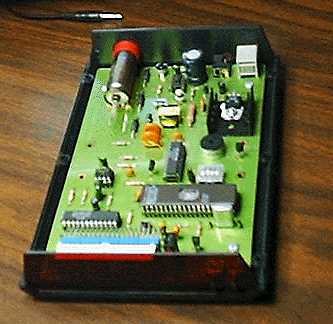 A small resistor in series with the GM tube provides a pulse whenever an ionizing event occurs, and this pulse is stretched by a one shot and then used to drive the interrupt input of a Dallas DS5000T microprocessor. The DS5000T has built in battery backed up SRAM and also a time of day clock, both of which are perfect for data logging. The remaining digital hardware consists of a four digit seven segment LED display (used to display the current background radiation count), an RS232 interface for uploading data to a host computer, and a few status LEDs and push button switches. The RS232 interface has a special provision to activate the DS5000 boot loader, which allows firmware upgrades to be downloaded to the unit without even opening the box. The hardest part of designing this device was the DC-DC converter, and in fact the reason for using a 555 was so that the operating frequency could be easily adjusted with a small trimmer pot. The output voltage of the inverter falls off rapidly unless the frequency of the oscillator is "tuned" to match the resonant frequency of the transformer, however fortunately the resonance is fairly broad so any minor drift or instability doesn't have much effect.